---. Homo Sacer: Sovereign Power and Bare Life, trans. Daniel Heller-Roazen. Stanford: Stanford University Press, 1998. Azoulay, Ariella, and Adi Ophir. ‘Abandoning Gaza’ in Agamben and Colonialism. Edited by Marcelo Svirsky and Simone Bignall. 178-204. Edinburgh: Edinburgh University Press, 2012. Bernes, Jasper. ‘Logistics, Counterlogistics and the Communist Prospect.’ Endnotes 3 (September 2013), https://endnotes.org.uk/issues/3/en/jasper-bernes-logistics-counterlogistics-and-the-communist-prospect. Castells, Manuel. The Informational City: Information Technology, Economic Restructuring, and the Urban-Regional Process. Oxford: Blackwell, 1989. Chua, Charmaine. ‘Logistics, Capitalist Circulation, Chokepoints.’ The Disorder Of Things (blog), 9 September 2014. https://thedisorderofthings.com/2014/09/09/logistics-capitalist-circulation-chokepoints/. Cowen, Deborah. ‘Containing Insecurity: Logistics Space, U.S. Port Cities, and the “War on Terror”.’ in Disrupted Cities: When Infrastructure Fails. Edited by Stephen Graham. Routledge, 2010. ---. The Deadly Life of Logistics: Mapping Violence in Global Trade. Minneapolis: University Of Minnesota Press, 2014. Danyluk, Martin. ‘Capital’s Logistical Fix: Accumulation, Globalization, and the Survival of Capitalism.’ Environment and Planning D: Society and Space, 9 April 2017. https://doi.org/10.1177/0263775817703663; Transnational Social Strike Platform, Logistics and the transnational social strike (Autumn 2017), journal, https://www.transnational-strike.info/wp-content/uploads/Logistics-the-Transnational-Social-Strike-%E2%80%94-TSS-Journal-Fall-2017-1.pdf. Easterling, Keller. Extrastatecraft: The Power of Infrastructure Space. London; New York: Verso, 2014.
endorsement letter, Connected Gaza website, 21 July 2016. https://dvqlxo2m2q99q.cloudfront.net/000_clients/561979/file/endorsement-letter.pdf. Estrin, Daniel. ‘Israel Speeds Up Underground Border Wall To Block Gaza Tunnels.’ npr.org, 24 January 2018. https://www.npr.org/sections/parallels/2018/01/24/579180146/israel-speeds-up-underground-border-wall-to-block-gaza-tunnels. Fassin, Didier, and Mariella Pandolfi. Contemporary States of Emergency. New York ; Cambridge, MA: Zone Books – MIT, 2010. Filiu, Jean-Pierre. Gaza: A History. London: C. Hurst & Co., 2014. Foucault, Michel. The History of Sexuality, Vol.1: An Introduction, trans. R. Hurley, new edition. London: Penguin, 1990. ‘Gaza food situation tight as Karni crossing closed.’ IRIN News, 7 March 2011. https://www.irinnews.org/feature/2011/03/07/gaza-food-situation-tight-karni-crossing-closed. Gisha, ‘Graphing 10 Years of Closure.’ gisha.org, September 2017. http://gisha.org/UserFiles/File/publications/Graphs/Graphing-10-years-of-closure.EN.pdf. ---, ‘An Inch at a Time.’ gisha.org, 11 February 2016. http://gisha.org/updates/4943. ---, ‘The Erez Crossing.’ accessed 13 June 2018. http://gisha.org/gazamap/403. Hass, Amira. ‘Hummus Starts Trickling Past Israel's Blockade on Gaza.’ Ha'aretz, 9 September 2011. https://www.haaretz.com/1.5168006 Available at: http://gisha.org/updates/1700. ---. ‘2,279 Calories per Person: How Israel Made Sure Gaza Didn’t Starve.’ Ha'aretz, 17 October 2012. https://www.haaretz.com/.premium-israel-s-gaza-quota-2-279-calories-a-day-1.5193157. Heinen, Christian. Geschichte der Logistik. Master Thesis, RWTH-Achen: 2004. H. Bratton, Benjamin. The Stack: On Software and Sovereignty. Cambridge, MA: MIT Press, 2016. Hesse, Markus. 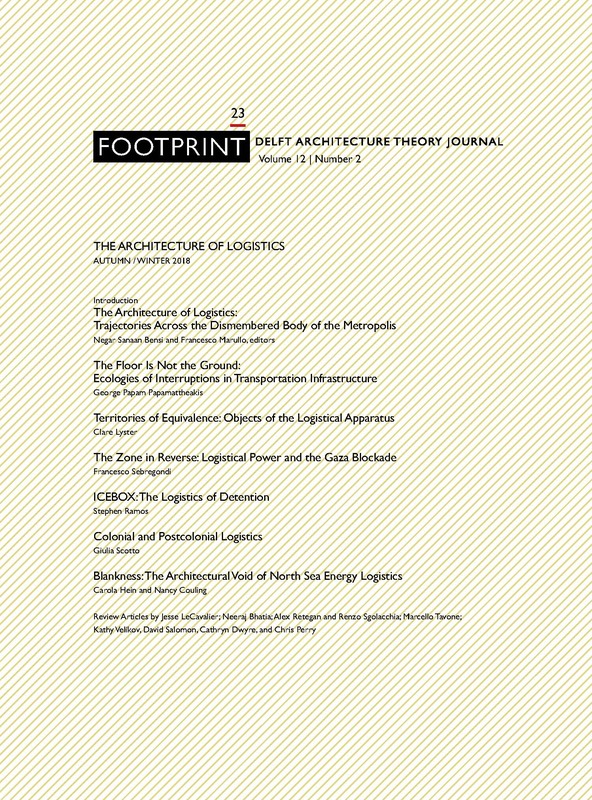 The City as a Terminal: The Urban Context of Logistics and Freight Transport. London: Routledge, 2008. ‘Inside Dubai’s labour camps.’ The Guardian, 8 October 2008. https://www.theguardian.com/global/gallery/2008/oct/08/1. ‘Israel Routinely Attacks Palestinian Civilians in the Buffer Zone.’ Al-Haq (website), 24 March 2016. http://www.alhaq.org/documentation/weekly-focuses/1034-israel-routinely-attacks-palestinian-civilians-in-the-buffer-zone. Kovács, Gyöngyi, and Karen M. Spens. ‘Humanitarian Logistics and Supply Chain Management: The Start of a New Journal.’ Journal of Humanitarian Logistics and Supply Chain Management 1, no. 1 (20 May 2011): 5–14. https://doSincei.org/10.1108/20426741111123041. Li, Darryl. ‘The Gaza Strip as Laboratory: Notes in the Wake of Disengagement.’ Journal of Palestine Studies 35, no. 2 (2006): 38–55. Nahata, Kushal. ‘Trends that will revolutionize logistics in 2018.’ Material Handling and Logistics News, 26 December 2017. http://www.mhlnews.com/global-supply-chain/trends-will-revolutionize-logistics-2018. Neilson, Brett. ‘Five Theses on Understanding Logistics as Power.’ Distinktion: Journal of Social Theory 13, no. 3 (December 2012): 322–39. https://doi.org/10.1080/1600910X.2012.728533. Netherlands Representative Office in Ramallah, Facebook post, 1 June 2016. https://www.facebook.com/NLRepOfficeRamallah/posts/602262163276743:0. Nissenbaum, Dion. ‘High-tech border crossing serves as monument to Mideast gridlock.’ McClatchy News, 25 May 2007. http://www.mcclatchydc.com/latest-news/article24463477.html. Noy, Orly. ‘IDF bans laptops, food, toiletries for Palestinians leaving Gaza.’ +972 Magazine, 16 August 2016. https://972mag.com/idf-bans-laptops-food-toiletries-for-palestinians-leaving-gaza/129292/. ‘Our Mission.’ Global Palestine Connected Gaza website. Accessed 9 April 2018. http://www.connectedgaza.com/test. Palestinian Centre for Human Rights, ‘Israeli Attacks against Palestinian Fishermen in the Gaza Strip (1 January – 31 October 2016).’ PCHR website, 16 December 2016. https://pchrgaza.org/en/?p=9631. Report of the Independent Commission of Inquiry, Gaza Conflict 2014,¬ A/HRC/29/52, 24 June 2015. Report of the UN Fact-Finding Mission on the Gaza Conflict, A/HRC/12/48, 25 September 2009. Rossiter, Ned. Software, Infrastructure, Labor: A Media Theory of Logistical Nightmares,. New York: Routledge, 2016. Rudoren, Jodi. ‘Between Gaza and Israel, a Border Crossing in Need of Travelers.’ The New York Times, 4 September 2014. https://www.nytimes.com/2014/09/05/world/middleeast/at-the-border-between-gaza-and-israel-a-crossing-in-need-of-travelers.html?_r=0. Sebregondi, Francesco. ‘The Smart City of Gaza.’ Volume 49 (2016): 81–84. State of Israel, ‘2014 Gaza Conflict: Factual and Legal Aspects.’ May 2015. http://mfa.gov.il/MFA/ForeignPolicy/IsraelGaza2014/Pages/2014-Gaza-Conflict-Factual-and-Legal-Aspects.aspx. Toscano, Alberto. ‘Logistics and Opposition.’ Mute, 9 August 2011. http://www.metamute.org/editorial/articles/logistics-and-opposition. ---. ‘Lineaments of the Logistical State.’ Viewpoint Magazine, 28 September 28 2014. https://www.viewpointmag.com/2014/09/28/lineaments-of-the-logistical-state/. Tsing, Anna. ‘Supply Chains and the Human Condition.’ Rethinking Marxism 21, no. 2 (April 1, 2009): 148–76, https://doi.org/10.1080/08935690902743088. United Nations Country Team in the Occupied Palestinian Territory, ‘Gaza in 2020: A liveable place?.’ August 2012. https://www.unrwa.org/userfiles/file/publications/gaza/Gaza%20in%202020.pdf. UN General Assembly, Michael Lynk. ‘Report of the Special Rapporteur on the Situation of Human Rights in the Palestinian Territories Occupied since 1967’. 23 October 2017. http://undocs.org/A/72/556. UN Office for the Coordination of Humanitarian Affairs – Occupied Palestinian Territory, ‘Gaza Strip Access and Movement – August 2016.’ 16 August 2016. https://www.ochaopt.org/content/gaza-strip-access-and-movement-august-2016. UN OCHA OPT, ‘Humanitarian snapshot: casualties in the context of demonstrations and hostilities in Gaza, 30 March – 7 June 2018.’ 7 June 2018. https://www.ochaopt.org/content/humanitarian-snapshot-casualties-context-demonstrations-and-hostilities-gaza-30-march-7-june. ---, ‘Monthly Humanitarian Bulletin.’ May 2018. https://www.ochaopt.org/content/53-cent-palestinians-gaza-live-poverty-despite-humanitarian-assistance. Virilio, Paul. Speed and Politics, trans. Mark Polizzotti. Los Angeles: Semiotext(e), 2006. Francesco Sebregondi is an architect and researcher, whose work explores the intersections of violence, technology, and the urban condition. Since 2011 he has been a Research Fellow at Forensic Architecture, former Coordinator of the collective project (2013–2015), and co-editor of its main publication ‘Forensis: The Architecture of Public Truth’ (Sternberg Press, 2014). His investigative work on Gaza includes the ‘White Phosphorus’ report (2012, with Michael Sfard and Human Rights Watch), the ‘Gaza Platform’ project (2015, with Amnesty International), and the ‘Conquer & Divide’ platform (2018, with B’Tselem). Since 2015, he has been a CHASE-funded doctoral candidate at the Centre for Research Architecture, Goldsmiths University of London. SEBREGONDI, Francesco. The Zone in Reverse. FOOTPRINT, [S.l. ], p. 25-36, nov. 2018. ISSN 1875-1490. Available at: <https://journals.open.tudelft.nl/index.php/footprint/article/view/2080>. Date accessed: 21 apr. 2019. doi: https://doi.org/10.7480/footprint.12.2.2080.